When someone has died not as a result of natural causes, but due to another person’s or entity’s gross negligence or misconduct, the individual’s passing is legally considered a “wrongful death.” Numerous and different circumstances may be involved to encompass such negligence or misconduct, including medical malpractice or bad drugs; automobile, motorcycle or boating accidents; workplace accidents; product malfunction; unsafe conditions; or even outright malice. While no amount of reparations can replace the death of a loved one, you should always demand justice, holding the responsible party or parties accountable for their actions, and obtaining proper compensation for the financial and emotional loss suffered by you and your family – including medical costs, loss of future earnings, and non-monetary damages such as loss of companionship and emotional anguish. If you have lost a loved one due to wrongful death in South Florida, you should seek the help of an experienced law firm. The Wrongful Death attorneys at Fenstersheib Law Group, P.A., are ready to assist you in this difficult time of your life, with the full knowledge and expertise acquired over more than three decades of legal practice. We feel your pain and, along with our legal expertise, offer understanding and compassion. Call 1-800-Tell Robert today for a free consultation to discuss all aspects of your case. Our phones are answered 24 hours a day, 7 days per week. 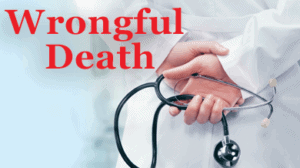 Home > General Blogs > What Does “Wrongful Death” Mean?